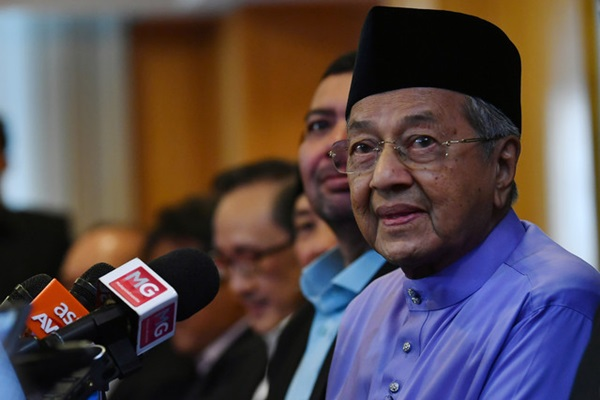 PUTRAJAYA: Prime Minister Tun Dr Mahathir Mohamad said he was satisfied with the work done to counter the effects of chemical poisoning on the people after inhaling toxic fumes emanating from chemical waste dumped into Sungai Kim Kim in Pasir Gudang, Johor. He said hospital staff did a very good job in tackling the crisis efficiently and preventing it from becoming worse. “It is unusual to have people poisoned by such chemicals, but it is obvious they have prevented any death from taking place. “Those still admitted in the hospital will also be discharged as soon as they recover,” he told a press conference after presenting Bersatu membership card to eight former Sabah UMNO Sabah leaders here today. Commenting on his visit to Pasir Gudang yesterday, Dr Mahathir said as a whole, the handling of the crisis was very good. He also reiterated that there was no reason to announce any emergency measure in the wake of the toxic pollution crisis. The dumping of chemical waste in Sungai Kim Kim, which broke out on March 7, had caused more than 3,000 people to seek medical treatment, while 111 schools in Pasir Gudang were ordered to close indefinitely. Asked on his stand on the new open approved permit (AP) policy recently announced by the government as he was a hard critique of the policy 14 years ago, Dr Mahathir said he felt that a proper regulation needed for AP approval. He said after he stepped down as the fourth Prime Minister in 2003, the AP was given to a lot of people and some of them became very rich because of it. “The AP is a way for people who are not in the automotive business to go into that business in an easy way,” he said. On Wednesday, the International Trade and Industry Ministry (MITI) announced that there was no limit to the number of AP to be released throughout the year under the new open AP policy implemented from Jan 1, 2019. “Through negotiations, you can fix a date for termination or conclusion, but sometimes things arise that prevent us from sticking to the date. Our target is by April,” he said. The ECRL project comes with a hefty price tag of RM55 billion and the prime minister previously announced that the project could be carried out at a cost of RM35 billion.